The myth of the Medicare improvement standard. Q: What is the Medicare Improvement Standard? A: What has been referred to as the “Medicare Improvement Standard” was actually a rule of thumb process that was utilized by Medicare contractors and adjudicators to deny and/or terminate coverage to Medicare beneficiaries who were not improving with respect to skilled nursing and therapy services in the home health, skilled nursing facility (SNF), and outpatient settings. As a result of the class action lawsuit and the settlement agreement, CMS acknowledged that when skilled therapy or skilled nursing services are required in order to provide reasonable and necessary care to prevent or further slow deterioration, Medicare coverage cannot be denied based on the absence of improvement or restoration potential. In written materials, as well as during the CMS provider call, CMS was quick to indicate that “Nothing in the Settlement Agreement modifies, contracts, or expands the existing eligibility requirements for receiving Medicare coverage.” This was also stipulated in the Settlement Agreement. Q: My practice is certified as a comprehensive outpatient rehabilitation facility (CORF). Are there special requirements that we must follow in ensuring that beneficiaries have access to skilled maintenance therapy? A: The maintenance program provisions outlined in the MBPM, Chapter 15, do not apply to the PT, occupational therapy (OT), or speech-language pathology (SLP) services furnished in a CORF because the statute specifies that CORF services are rehabilitative. Q: What information did CMS issue to help therapists in determining if a beneficiary qualified for skilled maintenance? A: CMS (December 6, 2013) provides enhanced documentation guidance in the revisions to the relevant portions of the MBPM in Chapters 7 (“Home Health”), 8 (“SNF”), and 15 (“Outpatient Therapy”). These revisions now include samples of general documentation, as well as clinical scenario-specific documentation examples that will assist in facilitating accurate coverage determinations for claims involving skilled care. Five potential maintenance program scenarios are presented [MBPM, Chapter 15 Section 220.2 (D)]. The following chart is for summary purposes only; readers are encouraged to read the entire case presentation to understand the full context of the CMS example. Q: Is there a special way to apply to have CMS approve a skilled maintenance program? A: This is not a preapproval process for a maintenance program. Therapists should conduct a comprehensive and thorough evaluation and/or reevaluation as indicated and establish the necessity of a maintenance program. The specific examples provided in the updated Medicare documentation requirements provide context to the type of enhanced documentation that CMS is suggesting be included in therapy notes. Q: What if a patient disagrees with the therapist’s evaluation that maintenance therapy is not medically necessary? What should the therapist and the clinic do? A: The establishment of medical necessity for skilled rehabilitative care, as well as skilled maintenance therapy, is left to the evaluating therapist. The therapist should conduct the evaluation based on the needs of the patient for skilled care and skilled maintenance, and should be done without regard to the financial limitations imposed by the therapy cap (when an exceptions process is in place). Some media coverage of the Jimmo Settlement may have led beneficiaries as well as referring physicians to believe that maintenance therapy “is now covered” by Medicare. If the therapist determines that skilled therapy or skilled maintenance therapy is not required, then the patient must be advised of the findings. It is up to the evaluating therapist to document the findings to the medical record and to make recommendations based upon the Medicare coverage criteria and the medical necessity for skilled rehabilitative or maintenance therapy. Q: Do claims for beneficiaries that require skilled maintenance go through the RAC audit process for manual medical review? A: A bit of background will assist in providing the answer to this question. On April 1, 2014, President Obama signed into law the Protecting Access to Medicare Act of 2014. The law extended the exceptions process for outpatient therapy caps through March 31, 2015. 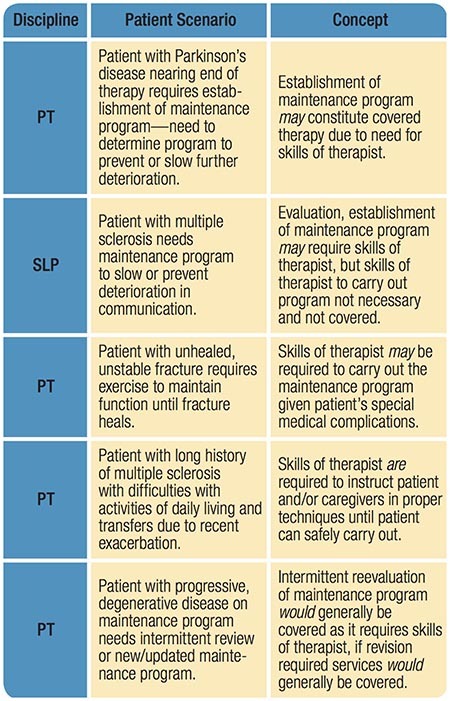 Section 103 contains a number of Medicare provisions affecting the outpatient therapy caps and manual medical review (MMR) threshold, including Manual Medical Review of Therapy Claims Above the $3,700 Threshold and continuation of the therapy caps exceptions process for therapy over the statutory Medicare Part B outpatient therapy caps of $1,920 (PT and SLP combined and a separate cap for OT) for 2014. Exceptions to the therapy cap are allowed for reasonable and necessary therapy services. Per beneficiary, services above $3,700 for PT and SLP services combined and/or $3,700 for OT services are subject to MMR. As a point of reference, CMS has made it clear that they are not precluded from reviewing therapy services below these thresholds (www.cms.gov/Research-Statistics-Data-and-Systems/Monitoring-Programs/Medicare-FFS-Compliance-Programs/Medical-Review/TherapyCap.html). According to Murphy, the CMA is working diligently with CMS to have this phrase edited and/or removed with respect to the terminology of “documenting improvement.” Therapists are advised that when MMR is conducted by a recovery auditor on a case involving skilled maintenance that a denial may be caused by this conflicting language, and they should be prepared to address this issue in the RAC discussion process. Q: Have the original plaintiffs in the Jimmo class action received their benefits? For a beneficiary whose maintenance care denial became final and non-appealable from January 18, 2011 through January 24, 2013, request for re-review must be postmarked no later than July 23, 2014; and for those whose maintenance care denial became final and non-appealable January 25, 2013 through January 23, the request must be postmarked no later than January 23, 2015. The Center for Medicare Advocacy has also provided a Self-Help Packet for Outpatient Therapy Denials to assist beneficiaries and their representatives through the labyrinth of the Medicare appeals process. This can be found at the CMA website: www.medicareadvocacy.org/self-help-packet-for-outpatient-therapy-denials. As a point of reference, this appeals process is available only to beneficiaries, not to providers or suppliers who were denied during the applicable time periods noted above. Q: Moving forward, if a therapy clinic’s claim for skilled maintenance is denied, does the clinic appeal, or does the beneficiary appeal? A: The therapy clinic can appeal on behalf of the beneficiary (the normal process) or the beneficiary may initiate the appeals process themselves. Due to administrative law judge (ALJ) appeals backlog and the subsequent work pause in the Medicare appeals process for the next 24 months, providers will not likely get an ALJ hearing within the next two years. 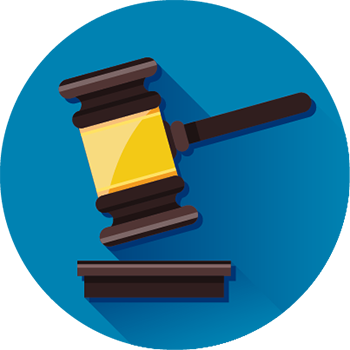 During this period, the Office of Medicare Hearing and Appeals (OMHA) has announced that beneficiary-directed appeals will have priority in the queue, but it still does not guarantee a timely hearing with the ALJ. Q: How will CMS identify claims that are for maintenance therapy to ensure that the improvement standard is not being applied for skilled maintenance therapy? What about continuing oversight? A: Under the Settlement Agreement, CMS is required to do a random sampling of Qualified Independent Contractor (QIC) decisions to determine if the corrected manual policies are being applied. They are also required to review up to a hundred claims brought to them by plaintiffs’ counsel, as well as to meet with plaintiffs’ counsel five times on a biannual basis. The Court maintains jurisdiction for three years from the date of the end of the educational campaign (had CMS issued an Administrative Ruling, the time of Court jurisdiction would have been limited to two years), during which time the plaintiffs have an opportunity to seek enforcement of any settlement provision(s) they believe are not in compliance with the settlement. The Center for Medicare Advocacy (CMA) is collecting patient and provider anecdotal information on the process during this implementation year and is finding both beneficiary and provider concern about the process. According to Margaret Murphy, the CMA would like to hear from providers about problems with the process, specific claim denial problems for maintenance, and issues related to the MMR process denials based on an improvement standard. Nancy Beckley, MS, MBA, CHC, s certified in Healthcare Compliance by the Compliance Certification Board and is a frequent speaker and author on outpatient therapy compliance topics. She advises practices on compliance plan development and audit response. She can be reached at nancy@nancybeckley.com. 1. Margaret Murphy is Associate Director of the Center for Medicare Advocacy. Located in the Center’s Connecticut office, Ms. Murphy supervises the Center’s Medicare administrative appeals projects and the work of the Center’s attorneys and staff. She is a co-counsel in the Center’s federal class action challenging the improvement standard and various individual cases challenging improper Medicare policies and denials. Author’s Note: A previous Impact Compliance Column (July 2013, Helene Fearon and Steve Levine) addressed the Jimmo Settlement Agreement. 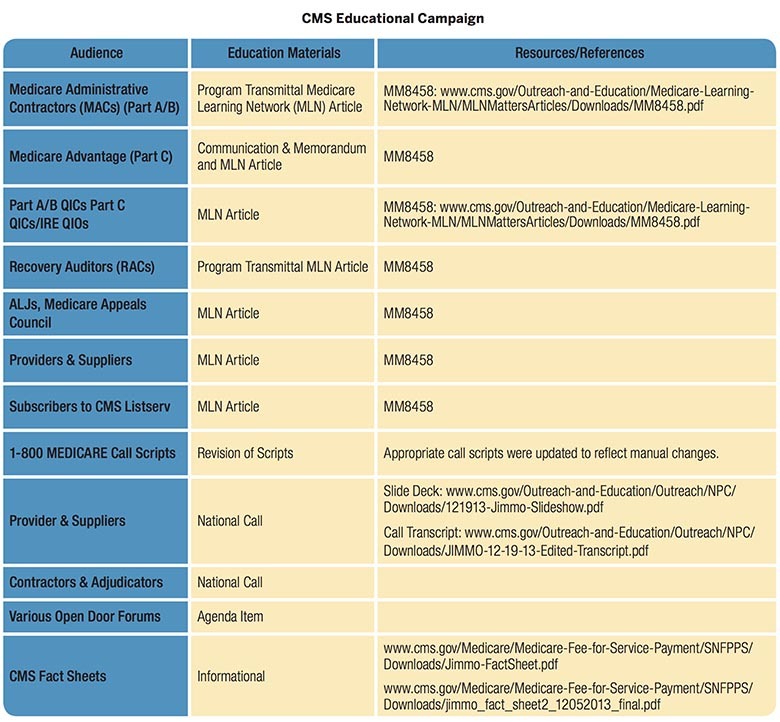 This column provides an update following the rollout of the Centers for Medicare and Medicaid Services (CMS) educational campaign mandated by the settlement, as well as information regarding the resources that have been made available to therapists in determining the need for skilled (outpatient) maintenance therapy, as outlined in the updated CMS manual instructions. Readers are encouraged to reference the earlier article for background information on the class action lawsuit and the elements of the settlement agreement. Additionally, there are a number of valuable resources on the APTA website on Jimmo, as well as related skilled documentation resources.